These tote bags with colorful front pockets make an attractive and useful gift! 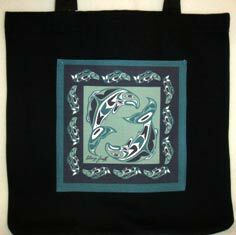 Black canvas tote bag with green Totemic Salmon design front pocket. Bag measures 17″ x 17″ square. 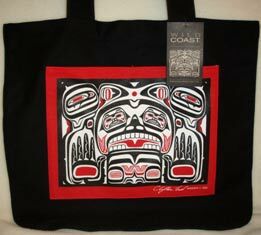 Black canvas tote bag with black red & white Totemic designed front pocket. Bag measures 17″ x 17″ square.